Campingplass La Mignardière er en campingplass i Ballan-Miré, Indre-et-Loire. Denne campingplassen har steder med avgrensning, med skygge og plasser med noe skygge. Det er mulig å leie campingvogner, stasjonære campingvogner og hytter. Campingplassen har lekeplass. For sportslige feriegjester arrangerer campingplassen ulike sykkelturer. For dem som vil slappe av etter en travel dag er det sauna, boblebad og skjønnhetssalong. Campingplassen har utendørs svømmebasseng, oppvarmet innendørs svømmebasseng og barnebasseng. Denne inspektøren besøker hvert år Campingplass La Mignardière og inspiserer campingplassen for ca. 200 fasiliteter og for andre punkt som forekommer. Inspektøren er en medarbeider fra ACSI og arbeider ikke for campingplassen. Staff very helpful and gave us good assistant. Went into Tours by bus connecting with tram. Day pass covered everything and cheap.swimmingpool nice in and outside.snacks ok and bread on site in small shop. Toilet block clean and toilet paper provided. lovely relaxing site with a mixture of British, French and Dutch. Great pool, friendly staff and good value shop. Restaurant opposite was excellent but worth booking as gets full. Good size pitches and good motorhome service point. Cheap as well. Stayed for one night only on way through. Nice clean site, good pool with bar and restaurant over the road, although I thought bar prices a little high. Very pleased with all facilities and would stay again. Really nice petting zoo over the road, nothing fancy but looked good value from what we could see (from the bar!). This is one of the best campsites I have ever stayed at!!! Well kept, extremely clean, up together a must stop! We stayed here for 3 nights in June 2016, and would certainly come back. The welcome was very warm and helpful, with a choice of pitches and full information about the area. It was roasting during our stay and the excellent pools were a wonderful place to cool down. We took the bus (stop outside the campsite) to the tram, and it took about 30 mins overall to get to the centre of Tours - all very straightforward. The pitches are a very generous size and provide a good bit of privacy. Overall, strongly recommended. Lovely quiet campsite and the staff couldn't have been more helpful. The toilet and shower/washing facilities were excellent and impeccably clean. Fresh croissants etc available every morning. Very conveniently situated for visiting Loire chateaux and Tours. Would definitely return here. Well placed to access from the major road that goes around the western side of Tours. The welcome was very warm indeed. The pitch was ok and the facilities pretty good. There is a pleasant lake a short walk away and a Lidl within walking distance. It would be a good site if you wanted to spend time in Tours or were passing as we were. We will definitely use this site again. Very nice site ideally situated to visit located Chateau. English speaking helpful team. Excellent clean facilities & fresh hot bread. Vil du booke campingplassen Campingplass La Mignardière eller få mer informasjon? Det går bra med opplysningene nedenfor eller via campingplassens nettsted. 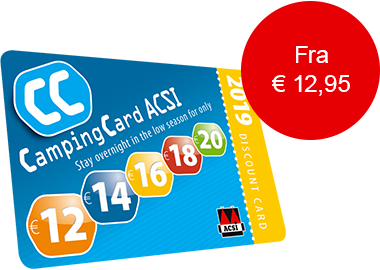 ACSI Eurocampings sender din forespørsel til "Campingplass La Mignardière".